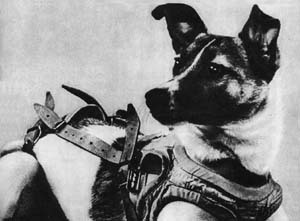 Laika, a three-year old, terrier-mix was picked up off of the cold Russian streets and became the first astronaut to orbit the Earth. On November 3, 1957, she was sent into her first space mission, only to die a few hours later. So why did the Soviets decide to send a dog into space? The decision to launch Laika was decided for two main reasons – scientific and (as always) political. The scientific reason was that no one knew how a living being would cope in space (let alone a human), and observing animals in space would provide some ground-breaking knowledge on this. So why not pick a dog off of the streets? They are already used to the extreme cold weather in Russia. The second (political) reason, was that Khrushchev, leader of the Soviet Union, wanted a ‘spectacular’ space mission to be launched on November 3, 1957, to mark the 40th anniversary of the Bolshevik Revolution that led to the formation of the Soviet Union. So, in the name of science, Laika was launched on a one-way trip on board Sputnik 2 in November 1957. Only, the Soviets didn’t announce that the trip was “one-way” until she was already in orbit. This outraged many people across the world! The Soviets hadn’t figured out how to land the shuttle. While it was first said that Laika died after six(ish) days in orbit, it has more recently been revealed that she died from overheating and panic just a few hours after entering space. She was placed in her restrictive module (cage) several days before the shuttle launch. Then she was covered in an alcohol solution and painted with iodine in several spots (so sensors could be placed on her) right before take-off. The sensors were to monitor her heartbeat, blood pressure, and other bodily functions to better understand any physical changes that might occur in space. temperature exceeded 59 degrees (F). In the days preceding, the dogs were kept in gradually smaller cages in order for them to adapt to the tight conditions of the “Sputnik 2”. Overall, three dogs were trained, but only Laika was chosen. The sensors that were placed on Laika showed that her pulse was elevated during the launch, as could be expected. Only when the shuttle started to lose gravity did her heart rate decrease. It took her three times longer in space than when she was preparing on the ground. This only further proved how much stress the dog was under! After seven hours, no life signs were found. Laika had passed away when the temperature and humidity started to increase. Between the overheating and stress, her body just gave out. On November 3, she will have passed away 55 years ago… In honor of Laika, please share this story with your animal loving friends! Don’t forget to like us on facebook!! I LOVE Laika. I collect stamps and have a stamp of her. RIP Laika.